Step One: Start with hot links or any other pre-cooked sausage (jalapeno cheddar, polish sausage, smoked sausage, etc). This will serve as the center of each serving. Cut them into bite-sized pieces or chop them up and form a bite-sized portion. The latter option gives the mini-fatty a better texture though it increases prep time. Step Two: Wrap it in breakfast sausage. 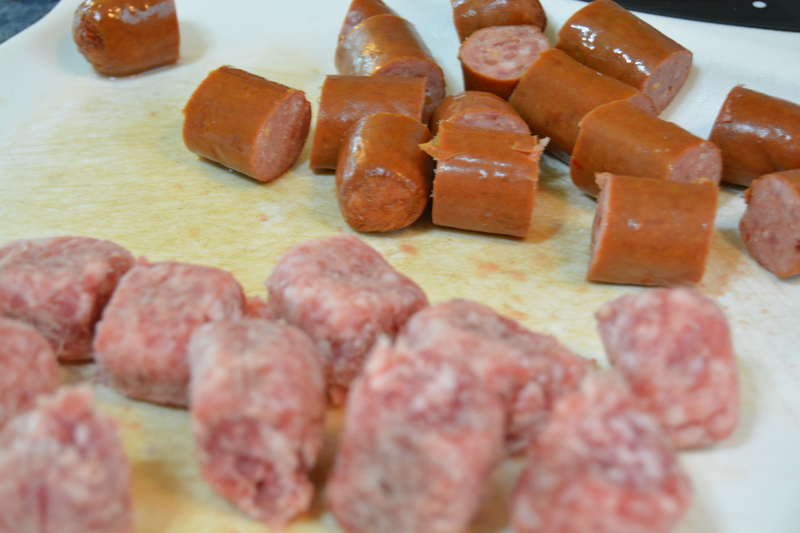 Any uncooked sausage can be substituted (chorizo, andouille, uncooked bratwurst, etc). Flatten a ping-pong size piece of the uncooked sausage in your hand and surround the hot link with the breakfast sausage. Step Three: Apply your BBQ rub. For this recipe, we used the Hasty Bake Rub N Spice. Sprinkle each serving with a light dusting of rub. 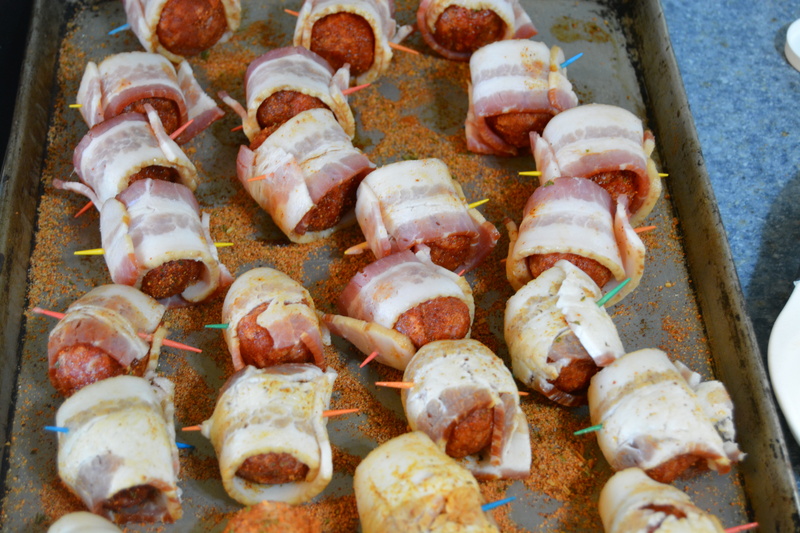 Step Four: Wrap each bite with half of a piece of bacon and secure with a toothpick. Step Five: Smoke! You’d be hard pressed to use a bad smoking wood for these, so use your favorite. We went with hickory, but apple, cherry, pecan, mesquite, or even peach would be great. 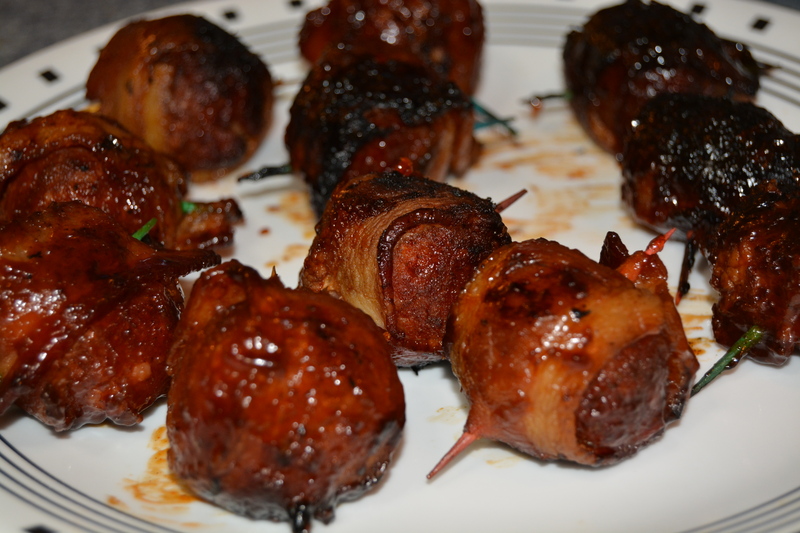 Cook them at 275° for about 45 minutes or until the bacon looks like it is almost, but not quite, finished. Step Six: Apply the glaze. 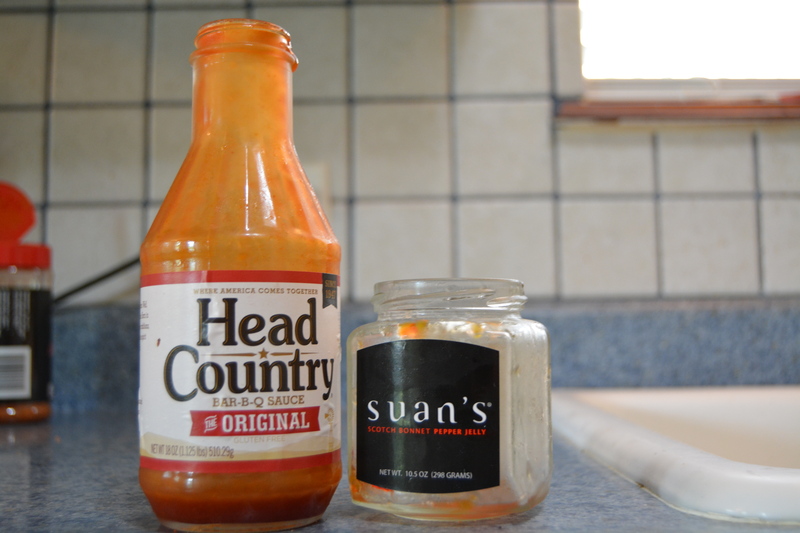 While the mini-fatties are cooking, combine 4 oz of pepper jelly (I used Suan’s Scotch Bonnet Pepper Jelly) with 18 oz of your favorite BBQ sauce (my local favorite is Head Country) in a sauce pan. Heat the mixture on the stove until it has thinned and mixed well. 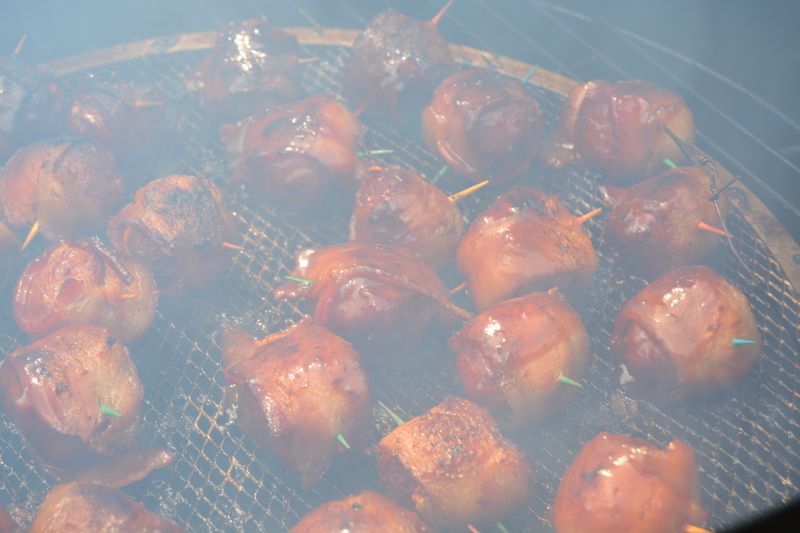 After the mini-fatties have cooked for about 45 minutes or when the bacon looks like it’s almost finished, take each one off the smoker, dip them in the glaze, and put them back on the smoker. Step Seven: Finish them. 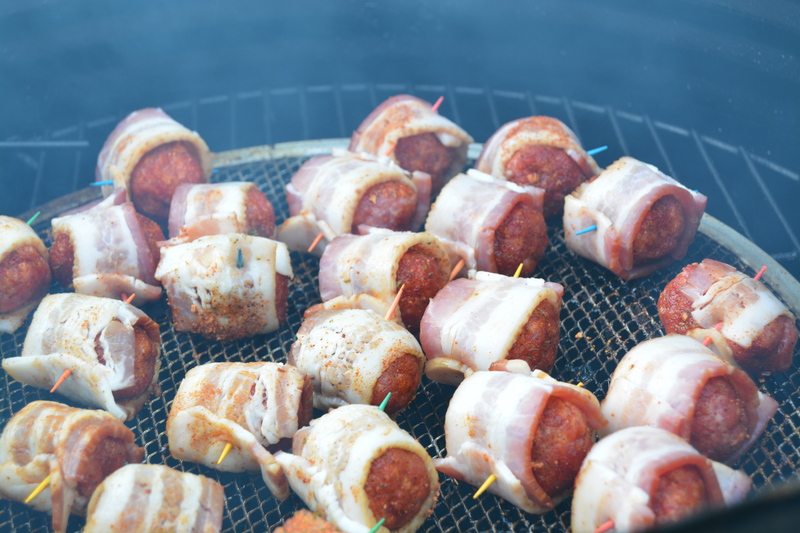 Cook for an additional 10-15 minutes or until the glazes, bacon crisps, and internal temperature reaches 160°. These taste great right off the smoker but even better if they sit in an insulated container or hot box for 15-30 minutes. You can prep these a day or two ahead of time and store in the refrigerator until you’re ready to cook them. This recipe can easily be modified to your taste. 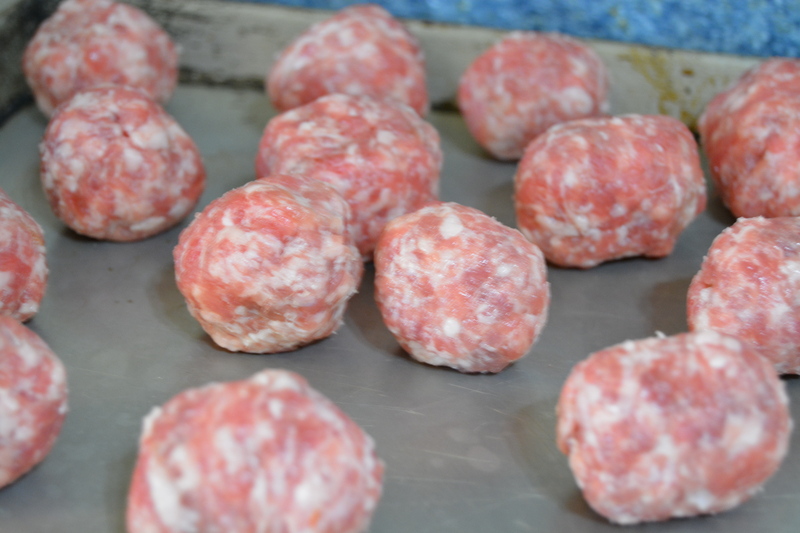 Get creative with the various types of precooked sausage, uncooked sausage, and bacon.